Adirondack Rock fully embraces the use of GPS coordinates, but doesn't rely on them for navigation. Everything you need to find a cliff—written instructions, maps, and compass directions—is included in the book. We've included GPS coordinates not only for those savvy with the technology and the patience to use it in the field, but for trip planning and as an adjunct for use with other tools, especially those available on the internet. GPS coordinates are in the UTM NAD-83 format. Very important: All coordinates in the book are in zone 18T. The forest canopy often makes navigation with a GPS difficult. However, we've found that once a GPS has acquired a signal, it's easy to maintain that signal in the trees, as long as you hold the GPS away from your body (in other words, you can't hang it around your neck). Don't lose the signal, or you'll have to find an open area so that it can re-aquire. Smartphones, for whatever reason, maintain their signal better. The GPS is handy for determining the direction of travel to a desired coordinate, but some units don't include a magnetic compass. Even though the unit gives you a compass bearing, you'll still need a compass to follow that bearing. Use the GPS to record waypoints, then plot those points later using online tools (like our mapping page). If you can't find the cliff, at least you'll be able to analyze your mistake later. UTM coordinates are compact (they don't take up much room in the text) and easy to represent. No decimal points, no degrees, no minutes. UTM coordinates are simple x/y values within a given zone. All of the coordinates in the Adirondack Park are in the same zone, so only the x/y values are needed to represent a given point. UTM grids are square (the N-S units are the same as the E-W units) and easily understood in the field (the numbers increase to the east and to the north). You can know by simple subtraction the number of meters you have to walk N-S/E-W between two points. UTM coordinates use a rectangular grid, which is easier and more accurate for location positions on a paper map. Most GPS units use a variety of coordinate formats. UTM isn't usually the default, but can be set easily enough. Once set, it's far easier to enter a UTM coordinate than a lat/lon coordinate. There is precedent for using UTM coordinates in other rock climbing guidebooks, although some still prefer lat/lon. Try our Mapping Page, a browsing tool for USGS topographical maps (among others). The page supports everything you'll need to explore the cliffs in the park. Browse a topo map (with zooming) to find a location. See the exact coordinate of the location on the map. Both UTM and Lat/Lng are supported. The first field is the zone (all coordinates in the book are zone 18) followed by the easting and northing. Click "Go" to center the map at that location. This box accepts a variety of coordinate formats, including UTM and Lat/Long. Create a link to a specific location, for emailing to others. Click the "Copy" button to copy the full URL to the clipboard, of click "this page" to open that URL in a new window. Show all cliffs in the park by turning on the cliffs layer (click on the "Cliffs" checkbox). Private Land: shades private land (be aware this is not always accurate). Relief Shading: shades the steep slopes. Cliffs: loads the cliffsonly.kml file showing pins for every known cliff. Park Boundary: shows the blue outline of the Adirondack Park. Book Regions: shows how the chapters in Adirondack Rock are divided up. Couties: shows the overlap of NYS counties on the Adirondack Park; useful for determining which county you're in, so you can view that county's online GIS tax map. Link to other popular mapping web sites at a specific location. Click on the various links to go to that site at the current location. Change the base map by clicking on the letter-icons in the upper left of the map. M OpenStreetMap street mapping of the world. S OpenStreetMap satellite imagery of the world. C CalTopo USGS maps by Matt Jacobs at CalTopo. A ESRI ArgGIS topographic maps. E ESRI ArcGIS satellite imagery. Adirondack Rock includes GPS coordinates of many trailhead parking areas. These can be used with Google Maps to create a driving map from your location to the trailhead. Unfortunately, Google Maps only supports longitude/latitude coordinates in decimal degrees, so you have to convert them. One way is to type the UTM coordinates on the mapping page: type the full coordinate into the upper-right text box and click "Go". The translated coordinate is longitude -73.72347435703593, latitude 44.127011038144026. You can also use NCAT (the NGS Coordinate Conversion and Transformation Tool). The GPS coordinates for all of the cliffs in the Adirondack Park are in this file. This is a KML file (an XML-based file), used for expressing geographic information for earth browsers. Support for KML files by the popular mapping sites (Google, Bing) is a moving target. At one time both sites fully supported loading KML files. Both sites have been updated to new interfaces with varying degrees of support for KML files. The KML file can be used with Google Earth, allowing you to "fly" around the park and see all the documented cliffs. This is especially entertaining. Right-click here and save the target onto your local machine as "cliffsonly.kml", then open that file in Google Earth. The KML file contains the volume and page numbers for each cliff in the book. The new Google Maps no longer supports loading KML files in the search box. (Google "Classic" Maps did, but this has been discontinued by Google.) We've built a mapping page that used the Google Maps API, but since Google began charging for use of this API (July 2018), we've rebuilt this page using the open-source Leaflet API, and a number of publically-available mapping services. Go to the mapping page and click on the "Cliffs" checkbox to see this KML in action. Google "My Maps" supports loading the KML file into a layer. First right-click here to save the KML file to your local machine. Next, log into Google Maps, then go to My Maps. Select "Create New Map", then, in one of the layers, select "Import". Load the KML file from your local machine. Although Bing Maps supports loading KML files (by specifying the KML file as the 'mapurl' parameter in the URL like this), it is limited to 200 points, making it an ineffective tool for use with this KML file. The new Bing Maps (which you can preview here) does not yet support loading KML files. We've made heavy use of our smartphones in researching the second edition of Adirondack Rock. Two apps that we recommend are Topo Maps by Philip Endecott, and Gaia GPS. These are not free apps (but the prices are quite reasonable). 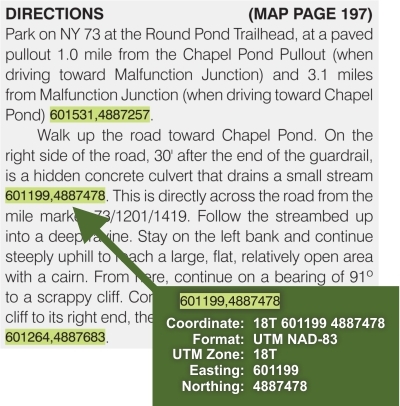 Both apps allow you to navigate with USGS maps (which are downloaded to the phone for use while out of cell range), record way points, and navigate to coordinates from this book.